Halloween party guests will Go Batty for this cake design. 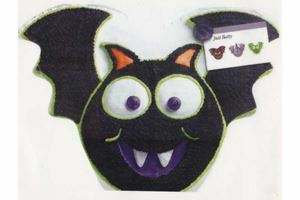 A little silly, a little scary, this "Batty Cake" will bring shrieks of delight into your Halloween celebrations. Halloween revellers beware—this Bat Puts the Bite on You. Sink your teeth into this spooky bat cake before it sinks its teeth into you.